Shri.Gupthan is representing the 8th generation of this astrology family. He started his education in Astrology and Sanskrit when he was 4 years old. He learnt Astrology from his father upto the Higher Secondary School period. For higher education in Veda Ganitha and Astrology Shri Gupthan was sent to Panditharajan Shri M V Uzhuthra Varrier. Shri Varrier imparted Gupthan all the various facets of Astrology & Astronomy such as Panchanga Ganitha (Veda Ganitha), Sanskrit, Deva Prashna, Ashtamangalya Prashna for a period of 8 years. Late Sri Subbarayan Embrandiri(Kerala Government Astrologer) was also the student of Shri Varrier alongwith Shri Gupthan. Shri.Varrier had assigned Shri Gupthan to publish his Bharatha Panchangam after him and the same has been honourably done by Sgri Gupthan every year since then. He entered his service age at 30 and became very popular by proving his vast knowledge and strong command in Astrology procured from his Guru and family hereditary in a short period of time itself. He has been invited and assigned the Panchanga Ganitha and Astrology service at the reputed house for Vasthu Shasthra nad Astrology, Kanippayyur Mana, Kunnamkulam by Panditharajan Kanippayyur Sankaran Nambudiripad. He could add to his career the professional expertise from Brahma Sree Sankaran Nambudiripad for over a period of about 30 years. Shri Gupthan has been honoured as "Ganitha Visharad", "Jyothisha Vachaspathy" by Sri.Kanchi kamakoti Madhapati for his service in Panchanga Ganitha and Astrology. Shri Gupthan has been honoured the "Nostrodomus Award 1998" by Express Star Teller for all the 10 predictions accurate for the year (Click here to view the 10 predictions). 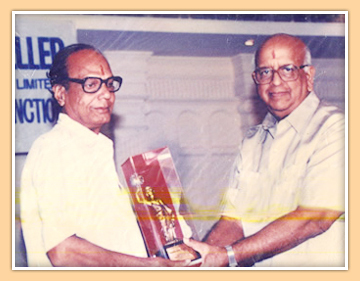 The award was given by former Chief Election Commissioner Shri T.N.Seshan. Shri Gupthan was also invited by Maharshi Shri Mahesh Yogi from Netherlands and provided his astrology service in various countries like Holand, Italy, Germany, Russia & America. Shri Gupthan started astrology education to his son Vijayakumar from his 4 years old itself. Gupthan had cared to continue teaching astrology alongwith his college education. He is now training his son Deva Prashna and Ashtamangalya Prashna by participating him in all astrological sessions in temples and families accordingly. Started a Astrology Institute and named "Jyothishakalalayam" at Chethallur in 1978. He taught number of students here. 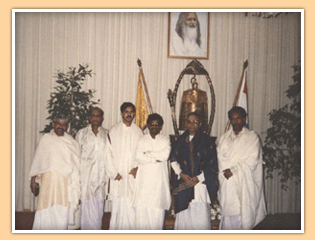 Sri.KanippayyurNarayanan Nambudiripad, Sri. Rajagopalan Kanippayyur are famous in this field.more about students click here..... A huge collection of Astrology Grandhas written in palm leaves are kept in this family. He could translate and publish "Krishneeyam" and "Prashna Kouthukam" with the help of Kanippayyur Grandha Sala. In these collections of Grandhas, manuscripts are available which describes about Prashna - "Nashta jathakam" - how to do prediction for those who lost their horoscope or does not know their birth details at all, "Thaskara Prashnam" - details about - how to do predictions about stolen goods. "Nashta Prashna" - details about how to do prodictions of goods or things lost Mr.Gupthan describes about misusing of Astrology like this "Incorrect Predictions happens only when they are made without proper knowledge. A Shasthra(Science) will never be false since Shasthras are done after Sasanam" . Now astrology is being handled by people without thorough knowledge and this may cause serious concern of its reliability.